Penelope and Bourne used to be best friends, but they haven’t seen each other in over ten years. They know of each other, meaning that he knows that after a humiliating and public broken engagement she never married, and she knows that he owns the gaming hell, but that’s pretty much it. So Bourne, who is blinded by vengeance, decides to compromise Penelope to force her to marry him; and Penelope, who even if she doesn’t admit it to herself has been waiting for him, accepts because even though she wishes for true love, she thinks that the next best thing, and marrying Bourne will be the ultimate adventure. So a relationship that started as a marriage of convenience quickly develops into something more, but vengeance, pain and resentment are huge obstacles to overcome, so the happy ending won’t be easy to obtain. 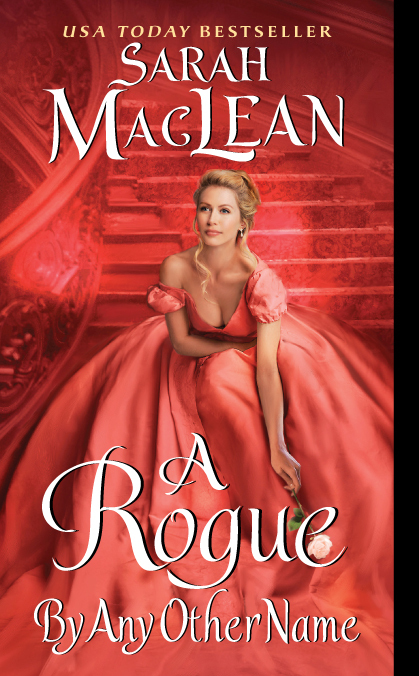 There’s no denying that Ms. MacLean is a talented writer. Her voice is beautiful and her books are fast-paced and enthralling. Some of that is present in this book. I read it in one day because regardless of the issues I had with it, I wanted to know how it ended. The story is never boring and overall it was an interesting book. However there were many things that bothered me about the book. First, it lacks a certain magic that was certainly present in her previous books. I think part of the problem was that there was nothing new about the plot. How many books have we read where the hero is a vengeful rake using the heroine to fulfill his personal vendetta, and then in the process finds love and redemption? And how many heroines fall for the rake just to be disappointed when their love doesn’t cure him? One of the reasons I loved her other series was because there was something unique about all of her characters and that was refreshing. There was nothing new here. Second, the hero was an idiot. Don’t get me wrong, I like mean, vengeful heroes, even if they are assholes. I don’t care about it as long as they have a good reason, Bourne did not have a reason besides his own immaturity and cockiness. Yes, someone took advantage of him and that someone was a villain, fine, but no one forced him to be there, let alone bet his entire legacy. This guy was mad at everyone, even at his best friend, a friend who actually tried to help him, but the only person he should have been angry at was himself. He behaves this way the entire book and never acknowledges that he was in part to blame for what happened. By the time he has a change of heart was too little too late for me, I couldn’t see him as anything but an idiot. Finally, we have the heroine. I liked her just fine, but why put up with this guy? I get it, she wanted true love and adventure, impossible not to get it since she repeats it over, and over and over again. She was in love with the idea of the hero, with her childhood friend, and since she couldn’t have that, she settled for the new Bourne, this did not endear her to me at all. I liked her, but not enough to save the book. Having said that, I think the next book is going to be awesome. The secondary characters were way more interesting than the main couple, Penelope’s sister in particular, and Bourne’s gaming hell co-owners in a lesser degree. They all have unique personalities and mysterious pasts, which added to Ms. MacLean talent, should make for great books. Regardless of how I felt about this story, I can’t wait to read what’s next. Overall it wasn’t a bad book, but it was seriously flawed. I think if you like historical romance and friend-to-lovers stories, then you should give this one a chance, but if this is your first time reading this author I recommend you to start with a different book. Ughhhh! This sounds like it had great potential but fell short. I too don't mind the kind of a-holish rogue types, but when their just kind of stupid...no bueno. But I will say you have convinced me to try Ms. MacLean's other books. I do love a good historical romance so I'll have to give her a go real soon. You should read her previous series, those books are wonderful! Just read them in order because there's a recurrent story line that ends on the 3rd book and it makes the reading experience more enjoyable. I liked this one more than you did. I don't know - I LOVE it when h/h are forced to marry early in a book. It's my favorite trope. I also love asshat heroes - as long as they are properly redeemed. To me he is...but I understand how it is not going to work for everyone. But I will say - the three other dudes..especially the next guy up - omg. I'm so intrigued with him!!! Excited. I also love it when they marry early and they hate each other and have to learn how to live together and love, but in this book it didn't work as well for me. Maybe I was a victim of my expectations since I loved her other books so much. The next book is going to be awesome! Both the hero and the heroine are quite different to the historical romance norm and very interesting. Who is the last guy? Thomas? I had a feeling he would make a good hero but I thought this was a trilogy. I skimmed through your review a little bit and checked the grade. Guess the only way I'll find out whether I like it or not is by reading it LOL. I was looking forward to it because of the heroine and I don't know, guess I was hoping for a "happy-go-lucky heroine thawing out the stuff hero" theme, but I guess that's not it, right? Oh, I have Eleven Scandals, but haven't read it yet. I skimmed through it though. Guess I have to find it out myself :) And actually, LOL, I like your reviews, because you're a tough grader :) The majority is so easily pleased LOL. You think I’m a tough grader?! That’s so nice of you to say! What’s the point of reviews if you are not saying how you really feel? And what’s the point of reviews if you like everything you read!!!?? I do wonder, about the everything you read. Don't you find that tiring?!? I mean, I understand some people are really easy to please... but still. Sorry you were disappointed with this one, Brie. I'm like Mandi and like this kind of trope, so will likely enjoy it even if it isn't a new plot with refreshing characters. ha! LOL! If you like the trope then you'll like the book for sure. Have you read her previous books?! They are so awesome!!! If you haven't, start there!